Perform several different tests all on the same sample, without operator intervention. Chinchilla Scientific offers a wide range of solutions for food and beverage analysis. Phynol, pH testing in wine, oil extraction, protein and fiber analysis. Chinchilla Scientific provides equipment for a variety of applications, which include environmental sciences, food and beverage, agriculture, industry, and pharmaceutical. The new Chinchilla Scientific Easy (1 – Reagent) Nitrate Method utilizes a “green” non-hazardous reducing agent which eliminates hazardous waste generation and exposure to carcinogens such as hydrazine and cadmium. The method has greater linear range and better detection limits than commonly performed methods. For laboratories performing environmental, industrial, and agricultural analysis, who need accurate, defensible data, and improved workflow and efficiency. The Simplicity Discrete Analyzer offers flexibility to quickly and accurately perform multiple parameters without operator intervention. Unlike conventional discrete analyzers, the Simplicity has been specifically designed with respect to USEPA methods, dynamic ranges, and detection limits. 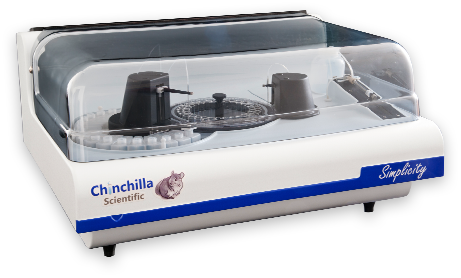 At Chinchilla Scientific, your needs are our priority. © 2018 Chinchilla Scientific, LLC. All Rights Reserved.